Since the flu pandemic was declared, there have been several so-called "vaccine experts" coming out of the wood work attempting to justify the effectiveness of vaccines. All of them parrot the same ridiculous historical and pseudoscientific perspectives of vaccinations which are easily squelched with the following 9 questions. One of the most critical elements which defines the toxicity potential of any vaccine are its pharmacokinetic properties. Drug companies and health agencies refuse to consider the study, analysis or evaluation of the pharmacokinetic properties of any vaccine. There is not one double-blind, placebo-controlled study in the history of vaccine development that has ever proven their safety, effectiveness or achievements (unless those achievements have underlined their damage to human health). Every single study that has ever attempted to validate the safety and effectiveness of vaccines has conclusively established carcinogenic, mutagenic, neurotoxic or fertility impairments, but they won't address those. Claim: Preservatives and chemical additives used in the manufacture of vaccines are safe and no studies have been linked or proven them unsafe for use in humans. 5. What to ask: Could you please provide scientific justification as to how injecting a human being with a confirmed neurotoxin is beneficial to human health and prevents disease? 6. What to ask: Can you provide a risk/benefit profile on how the benefits of injecting a known neurotoxin exceeds its risks to human health for the intended goal of preventing disease? Fortunately, the drug companies still tell us the damage vaccines have on the human body. People just don't read them. All you have to do is look at the insert for any vaccine, and it will detail the exact ingredients, alerts and potentially lethal effects. See my latest analysis of the Arepanrix H1N1 vaccine for an example. 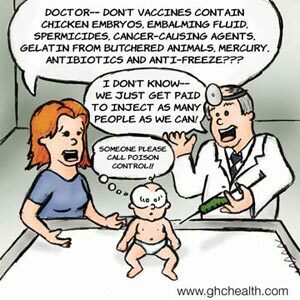 Any medical professional who believes that it is justified to inject any type of neurotoxin into any person to prevent any disease is completely misguided, misinformed, deluded and ignorant of any logic regarding human health. Claim: Once an individual is injected with the foreign antigen in the vaccine, that individual becomes immune to future infections. 7. What to ask: Could you please provide scientific justification on how bypassing the respiratory tract (or mucous membrane) is advantageous and how directly injecting viruses into the bloodstream enhances immune functioning and prevents future infections? 8. What to ask: Could you please provide scientific justification on how a vaccine would prevent viruses from mutating? 9. What to ask: Could you please provide scientific justification as to how a vaccination can target a virus in an infected individual who does not have the exact viral configuration or strain the vaccine was developed for? All promoters of vaccination fail to realize that the respiratory tract of humans (actually all mammals) contains antibodies which initiates natural immune responses within the respiratory tract mucosa. Bypassing this mucosal aspect of the immune system by directly injecting viruses into the bloodstream leads to a corruption in the immune system itself. As a result, the pathogenic viruses or bacteria cannot be eliminated by the immune system and remain in the body, where they will further grow and/or mutate as the individual is exposed to ever more antigens and toxins in the environment which continue to assault the immune system. Despite the injection of any type of vaccine, viruses continue circulating through the body, mutating and transforming into other organisms. The ability of a vaccine manufacturer to target the exact viral strain without knowing its mutagenic properties is equivalent to shooting a gun at a fixed target that has already been moved from its location. You would be shooting at what was, not what is! Flu viruses, may mutate, change or adapt several times over a period of one flu season, making the seasonal influenza vaccine 100% redundant and ineffective every single flu season. Ironically, the natural immune defenses of the human body can target these changes but the vaccines cannot. - They will attempt to discredit unrelated issues that do not pertain to the question. - They will formulate their response and rebuttal based on historical arguments and scientific studies which have been disproved over and over again. Not one pro-vaccine advocate will ever directly address these questions in an open mainstream venue.